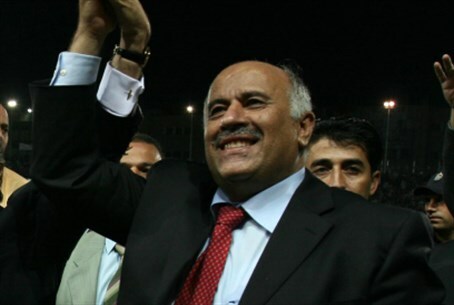 Palestinian Football Association head vows to push ahead with efforts to have Israel suspended from FIFA. The Palestinian Football Association vowed on Sunday to push ahead with efforts to have Israel suspended from FIFA, following joint talks with the FIFA president Sepp Blatter in Zurich, reported AFP. At the same time, however, both sides agreed to continue talking with Blatter, who announced plans to visit the region for top-level talks with Israeli Prime Minister Binyamin Netanyahu and Palestinian Authority (PA) chairman Mahmoud Abbas on the issue. News of the visit was announced by Blatter on Sunday as he met with Israel Football Association (IFA) chief Ofer Eini and his Palestinian counterpart Jibril Rajoub. FIFA said the main purpose of the meeting was to discuss the Palestinian FA's request to suspend their Israeli counterparts at the upcoming FIFA congress which starts on May 28. The Palestinians said there had been no progress at the meeting, adding they would not be deterred from efforts to have Israel suspended. "It is clear that the Israeli Football Association is not willing to recognize the PFA as a federation with equal rights and obligations, just as they continue to violate their commitments made before FIFA," Rajoub said in a statement quoted by AFP. "We are therefore determined to continue our path to suspend the Israeli Football Association during the next FIFA Congress," he added. The PA, which has been a member of FIFA since 1998, is currently pressuring world football's governing body to bar Israel from international competition over its restrictions on the movement of Palestinian Arab players. The PA wants the matter put to a vote at the annual FIFA Congress where it will only pass if it gets the support three-quarters of the 209 member federations. In a statement, the IFA said the parties discussed "various possibilities for cancelling the Palestinian request to hold a vote on Israel's suspension at the upcoming congress", with Eini saying he was "a little more optimistic" after the talks. Eini praised Blatter's "sincere efforts" to resolve the matter, but said they were preparing for the eventuality of a vote. "I am convinced that it will be possible to move forward in a more significant way during Blatter's visit to the region, and it is important that the dialogue continues," he said in a statement quoted by AFP. "This is an attempt to mix politics and sport, and there is no place for this within FIFA," added Eini. "It is clear to me that most FIFA members understand very well the intention behind this Palestinian move and the destructive impact it would have on the agency," he said. The Palestinian Football Association has tried in the past to have Israel expelled from international tournaments for restricting Arab teams from entering PA controlled territories. In response, Blatter had threatened to suspend Israel, which later said it would allow the players free movement. Blatter has recently spoken out against suspending the Israeli FA. "Such a situation should not come up at the FIFA Congress because the suspension of a federation, whatever the reason may be, is always damaging to the organization as a whole," he said in Cairo last week.